Expanding its presence in the North American market, Palfinger has introduced seven new cranes, ranging from the cost-efficient PK 19502 to the high-performance PK 37002 and PK 46002. Models PK 19502 and PK 22002-EH both have a lifting capacity of 13,440 lbs. Smart Scale system is now available for trucks and tractor-trailer combinations with air-ride or mechanical suspensions. The Smart Scale system features a wireless handheld receiver to allow drivers to maximize payloads and avoid overweight tickets in field loading applications such as aggregate hauling and liquid/dry bulk hauling. As part of the $2.1 million restoration effort of the Olympia Theatre and Apartment Building in Miami, Fla., Helifix, Inc. provided a supplementary and sustainable lateral and gravity support system for the building’s distressed veneer. The Helibeam System was an efficient green alternative in restoring the historic theatre. Designed for heavy-duty construction environments, the XAS 750 JD7 Tier 4a portable compressor generates 750 CFM of air at 100 psi. Its 200-hp John Deere engine uses Exhaust Gas Recirculation technology to reduce NOx emissions. Automated C&C dust collect and convey system from Cyclonaire captures nuisance dust from silo filling operations and automatically sends it back to the source silo. ForceMeter uses proven strain gauge technology to sense the force of the fluid in the flow stream. The integrated display offers an easy-to-read, two-line display for flow rate and total. With no frictional moving parts and all-welded construction, the gauge provides exceptional reliability and durability. Networkfleet Connect is a robust set of field management capabilities that seamlessly integrate with compatible Garmin navigation devices. With Connect, fleet managers can assign jobs, dispatch drivers to specific destinations, provided turn-by-turn directions and communicate with drivers in real time, all via the driver’s in-cab Garmin device. The 40-lb.-class CP1210 pneumatic handheld breaker is designed to deliver 90 percent of the hitting power of a 60-class breaker. The CP1210 breaker features a swivel design for reported increased maneuverability and a piston with lubrication grooves. The handheld tool is available with different shanks and in vibro-reduced, silenced and un-silenced versions. The MD Series provides those involved in bulk material handling process engineering, production supervision, and equipment maintenance, a material metering valve that immediately contributes tangible operating efficiency advantages, and long-term production and maintenance savings. The equipment suits cement pump applications where powder is transferred from mills to silos, or from silo to silo. It can also be used in batching applications from bulkers and/or bags to silos, plus pneumatic feeding of filler units. The MD Series can also be used as a valve/ meter in applications for metering cement discharge from storage hoppers or filer units. Another application is pressure modulation and dust release in dust collection systems. The Commercial Motor Vehicle Advanced Safety Technology Tax Act of 2011 (H.R. 1706), recently introduced by Congressman Geoff Davis (R-KY) and Mike Thompson (D-CA), would provide an income tax credit for truck and fleet owners. Troy, Mich.-based Meritor WABCO notes that its SmartTrac Stability Control System and OnGuard Collision Safety System are among technologies included in H.R. 1706. Pneumatically powered Famatec Friendly ergonomic manipulators, in models of 330-, 550- and 880-lb. capacities, counterbalance heavy loads to allow an operator to suspend, rotate, tilt and transfer product. Equipped with appropriate end-of-arm tooling, it adapts to the operator's preferred working height and position, allowing loads to be smoothly and progressively positioned and placed during assembly, suspended for further processing, or simply transferred from one location to another. Once suspended, the product can be moved manually or under power. Rampf Molds Industries arrived at 2011 Icon Expo in Las Vegas with a prototype of blocRoc, equipped to add textures to building block or retaining wall unit faces. Company’s new generation of block & paver machine wear plates are manufactured from exceptionally abrasion-resistant ExtraChrome hard-weld steel in a distinctive new ‘Snake’ pattern. ExtraChrome Snake wear plates are engineered to offer longer service life for less downtime and better plant efficiency, product engineers note. The pattern prevents abrasive particles from becoming trapped between straight weld runs found in traditional hard-weld steels, they add, helping to minimize wear during pallet movement. Company’s new 3500 Power Unit is designed to be used in high-volume, high-speed, pre-stressing operations. Flange lock functions as a cap that slides onto a hydraulic line fitting and is sealed with one turn of the bottom plug, keeping oil in and contaminants out. BMH Systems announced at ConExpo-Con/Agg its newest mobile offering: the EG-8 with a rating of 130-yd./hour, 10-yd. batchers, single compartment cement bin holding 40 tons and triple compartment aggregate bin holding 75 tons. As the vehicle approaches the company’s wheel wash system, the wash cycle is automatically activated by a proximity sensor. A technically engineered spray system creates an effective washing result for the complete length of the vehicle as it slowly drives through the wheel wash system at walking speed. The angled profile construction of the wash areas flexes open the tire profiles and supplements the cleaning effect, helping to dislodge heavier soils. Each system is equipped with nozzles in the tread area as well as custom-milled, side spray nozzles, which are easily adjustable to provide the most effective cleaning spray pattern for each side. Multi-Pump allows management to precisely track and document the usage of every fluid, including fuel, engine oil, transmission fluid and hydraulic fluid, for each individual vehicle and equipment unit in the fleet. A wireless, paperless, "hands-free" technology that IDs each vehicle, its location, and the fluids dispensed to it, Multi-Pump has a GPS antenna and a radio antenna. Company has announced a new generation of products for its TrimFleet construction supply fleet management solution. The new mobile computing hardware, software and sensors allow organizations to increase productivity and efficiency. The new products are a solid and expandable foundation for applications that can change the way construction material producers operate today. Off-highway equipment lubricantsThe UltraMax product line is formulated to extend the life of off-highway engines and equipment by going beyond OEM standards to outprotect, outperform and provide better cost containment, the manufacture contends. Line includes engine oils, gear oils, transmission fluids and high-performance hydraulic oils. 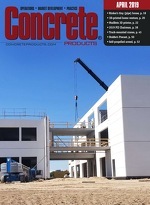 Among changes announced by Construction Specifications Institute (CSI) to be reflected in its updated Fall 2009 Construction Documents Technology Certificate exam are added topics in the “Fundamentals” category, including building information modeling (BIM), integrated project delivery (IPD), and green building, i.e., GreenFormat and sustainability. Aggressive measures lawmakers and regulators advanced this past month enable historic expansion of the federal government's role in concrete and cement. At its annual convention, the Architectural Precast Association announced winning 2009 APA Awards for Design & Manufacturing Excellence Competition projects. Liqui-Hard Ultra concrete densifier and chemical hardener is a ready-to-use, colorless liquid that hardens and dustproofs concrete at a molecular level. Cemstone positions high-reactivity metakaolin (HRM) in the supplementary cementitious material mainstream. Under a new partnership with Calgary-based Whitemud Resources, Inc., Cemstone Products Co., Mendota Heights, Minn., has begun using WhitemudMK branded HRM in concrete mix designs for heavy/civil work, including bridges, structural slabs and parking garages. CRH Plc Chief Financial Officer Myles Lee will succeed Liam O'Mahony, who, as previously announced, plans to retire as chief executive at year's end. A primer on the key components of the Standley-Batch system. View video. Hanson Paver Products Inc. announced last month purchase of the stock of Toronto Vault and Concrete Products Limited, operating as Perma Paving Stone. A Cemex Building Awards ceremony in late May honoring 12 finalists in outstanding construction and design achievement marked the company's inaugural U.S.
Hanson Plc Chief Executive Alan Murray hosted a two-day analyst and investor site visit of some of the company's operations in the Dallas area last month. The National Ready Mixed Concrete Association announces a comprehensive education and certification program, plus expansion of its driver-training series.